Silver, embossing, casting, engraving, gilding. Russia, Moscow, the Moscow Kremlin workshops, the late XVIIIth century. Silver, casting, embossing, niello, gilding. Belonged to Tsarevitch Alexei, the son of Peter I.
Russia, Moscow, the Moscow Kremlin workshops, before 1693. Belonged to the boyar B. Khitrovo. 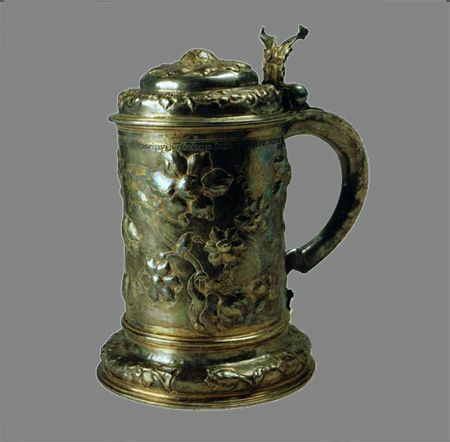 Tankards - one-handled drinking vessels, commonly made of precious metals, sometimes fitted with a hinged lid - have been executed in Russia since the XVIIth century. Up to that time they have been brought abroad as diplomatic gifts or saleable goods. Forms and decoration of tankards were taken from similar tableware by foreign makers. They were decorated with embossed scenes of antique and secular life, landscapes, foliate ornament. Decor of such vessels could include coins or pieces of ivory, mounted in their surface, as well as casted figures on their lids. 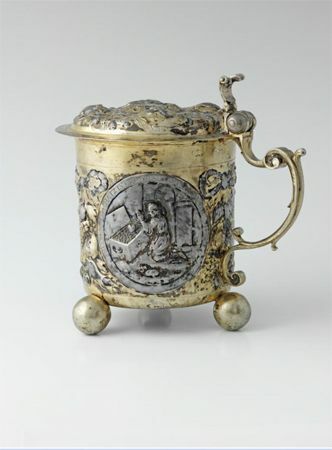 Silver and partly gilded tankard, executed by Maker F.J. Drentwett III in Augsburg (img. 5), is decorated with delicate embossed symbolic images and inscriptions. 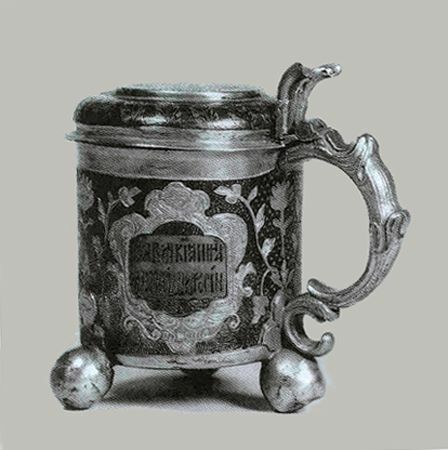 Its style has been replicated by the Russian makers in form and ornamentation of the tankard belonged to Tsarevitch Alexei Petrovich (img. 6). In the second half of the XVIIth century Russian silversmiths began to follow the fashion of West European art and widely used decorative motifs and styles of jewellery and tableware by German, English and Swedish makers.